Ugh. I am sick. Not sick, sick. But sick of the hospital and, well, the food. Especially the food. One disadvantage of being allowed to go home over the weekend is that the return to the hospital is never easy, or pleasant. At home, I get yummy home cooked food. Simple food, but yummy and nutritious nonetheless. Breakfast at home is fairly varied, and it can be as simple as toast with a cheese spread, or something a little more elaborate with bacon and eggs. Over at the hospital it’s toast (white or brown) with cereal. Well, you get a choice of Wheatbix, Cornflakes or Branflakes but after 2 months of eating that for breakfast, it’s enough to drive even the most enthusiastic cereal eater insane. Lunch and dinner are fairly standard. 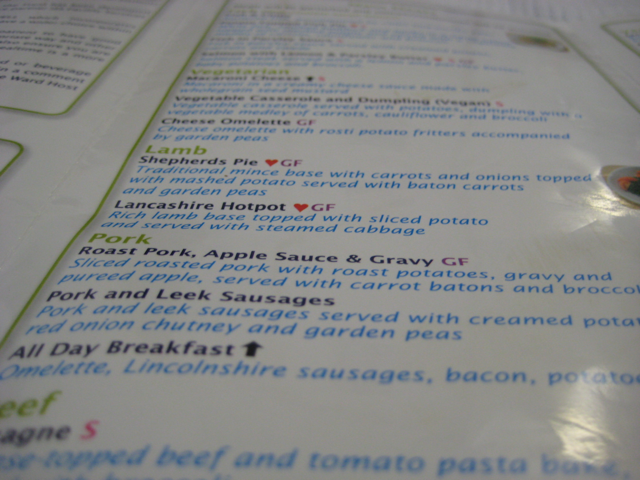 They are still on the Autumn and Winter menu here, although it’s well into Spring. Can’t imagine it to be any different though. On paper, the meals here look like anything that you can get in a decent cafe or pub. I mean, I’ve always liked Shepherds Pie, but in reality, the one we get here is dire. Ugh. I think I’ve been put off Shepherds Pie forever. And peas. I like peas. Or should I say ‘liked’ peas. Until my stint here. Yuck. The curries and Halal food aren’t bad to be honest. I’ve had worse curries in London. Plus I’ve had to pay for it. In fact I’ve ordered them so often some of the staff here though I was a Muslim! They got a bit worried when I ordered a Halal curry for lunch and pork sausage for dinner! Haha. Maybe I should be thankful that they’re actually feeding me. 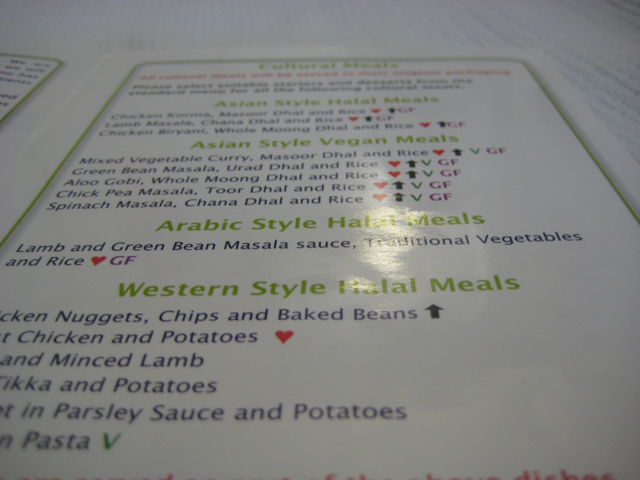 And the food has been ‘specially selected by a nutritionist’ for patients with Haematological conditions. I’ve heard that hospitals in some countries don’t feed their patients. Can’t imagine that but there you go. Anyway hopefully I won’t have to endure it for much longer. I’m now waiting to be discharged so I can go home for a few weeks before the intensification phase starts. It’s Wednesday, 30th March and I am still in the Funhouse. Although the family and I both bear hopes of me being discharged before the weekend, that largely depends on my bloods and how they are over the next few days. At the last check, my Neutrophils were 0.4 and I am getting a blood transfusion (again) so my Haemoglobins are low. As expected, the dose of Cyclophosphamine on Tuesday left me drained and woozy, and I still feel that way. It normally gets better by Thursday, so hopefully I will feel better soon. Guess all I can do now is wait for my Neutrophils to go above 0.5 before I can be discharged. The wife has been complaining that she’s eating a lot lately. Peanut seems to be growing very well. The wife isn’t too thrilled about it, as she keeps saying that she’s going to look like a whale. Growing a child is hard work and the body needs all the nutrition it can get. We got the Ottolenghi cookbook recently, and I plan to make a few salads and so on for her to take to work. At least we know what has gone into the food, not like some of the mystery food out there. This course went by really quickly to be honest. Maybe it’s because I knew what to expect from the treatment, and I am better prepared for it. Maybe it’s because I was allowed to go home for weekends. Maybe it’s because I worked 2 days a week. Or maybe it’s because I exercised and went for walks in the morning. Whatever it was, it worked cos I feel much better, more energetic and basically, healthier. The next phase is the intensification phase, but before that, I need another biopsy and another consultation with the consultant. Hopefully it won’t be too long before it starts although since I will be working, I think the time will pass a lot quicker than the last time round. Intensification is done over a 6-week period (ideally) and it usually involves a 3-day stay in the hospital max at a time. So I spend 3 days in the hospital for during weeks 1, 3 and 6. Details aren’t confirmed at the moment, but standard treatment procedure calls for 1 L-Asparaginase jab per hospital stay (the jab I got during course 1) but at a much higher dose. I got 5000 units for course 1, and this jab will be 10,000 units. There’s also 1 course of high-dose MTX per hospital stay (same drug that was given as an intrathecal in Courses 1 and 2), but as an IV drip. The MTX dose given as an intrathecal was 1.5mg. The MTX dose given through the line will be 3g so a significant increase. Whatever it is, I will be glad when this whole thing is over. Then it’s time to get back to the more important things in life! It’s been an interesting few weeks. I’m finally Neutropenic (not happy about it) but it had to happen. Peanut is growing and is also seriously kicking. The wife reckons that Peanut can kick up to 15 times in 2 minutes. And they aren’t soft kicks. Not bad for a 20-week old. We also reckon that Peanut will be quite a willful baby. If you lean or push on the wife’s belly too hard, Peanut will respond and shove you back! The wife’s bump is also growing larger. I posted a picture of her bump at week 17, here again for comparison. It’s week 20 now, and the wife looks noticeably more pregnant now. She’s (very reluctantly) ditching her normal clothes and moving on to maternity clothes.The bump is also growing larger and ’rounder’. There doesn’t seem to be much difference in the bumps between weeks 17 and 20, but believe me, there is. It’s also growing quite rapidly, although apparently it’s stil quite small compared to some other British women. Maybe it’s because she’s very small compared to the Brits. Anyway, it’s probably time for it to happen. The sign’s back up on the door. Most people would have been Neutropenic by week 2, but I am in week 4 and my Neutrophils have generally maintained itself over 1.0 for quite some time. It dipped to 0.5 over the last few days. This means that I have to be more careful about what I eat and what I drink, and people coming into my room will need to wear the apron thing and wash their hands. What bugs me about being Neutropenic is that my movements will be restricted. I need to stay in the room most times, and I may not be allowed to go home on weekends. The doctor did say that if I was doing well, and am not sick, they may let me go home or go out for a walk. But I would need to wear a mask if I was walking around the hospital and I can’t leave home if I was going home. I can’t leave the flat and will need to be driven to and from the hospital. I can’t even take a cab to the hospital. I also can’t cook or get anywhere near the kitchen. Which is a bummer cos I was dying to make the Singapore Fried Hokkien noodles sometime over the weekend. Oh well, I can make it again some other time. But looking back at the last 4 weeks, I guess I have been doing much better. I am not as weak as when I finished Course 1 and I haven’t lost as much weight. I can still do light exercises and can walk for much longer than before. So it’s all still good. There’s only 1 last chemo drip to go on Tuesday next week and then I am done for Course 2! Yayy!! Room 5 Dacie Ward. My abode for the past 4 weeks or so. It’s virtually identical to the room I was in previously, even down to the TV with a remote that doesn’t work. As with the other room, the view from my room is non-existant. But instead of a power substation, I now look into someone’s office and the day patient chemotherapy rooms. An improvement I suppose, at least you get to see people through the windows. 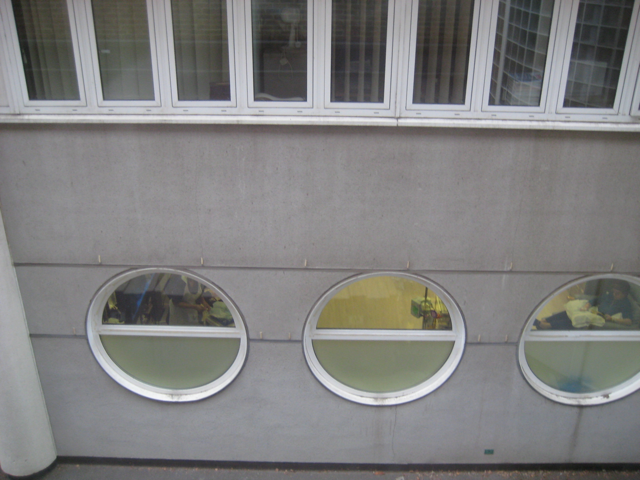 The round windows are the chemotherapy day rooms, where people come in for chemotherapy and then they leave. The windows above are offices and there’s also another ward above that. So it’s a busy, tall building that blocks most of the sunlight that could be coming into my room. At least in the last room I was in I could get a little bit of sunlight. This is the apparatus that I get hooked up to when I need a drip of some sort, such as chemotherapy drugs, minerals, bloods, saline, etc. 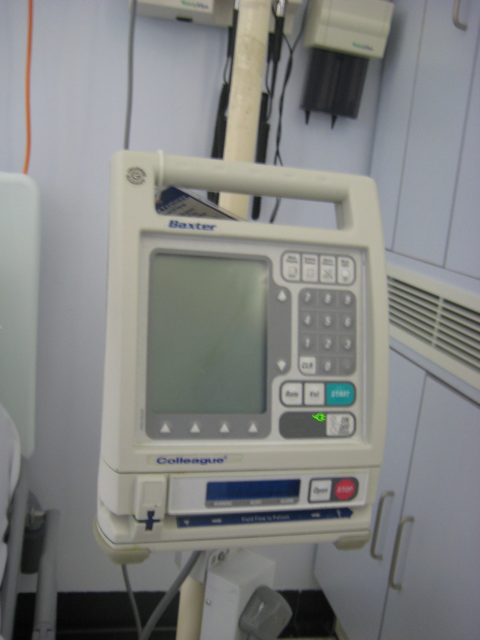 It’s called an infusion pump and it regulates the flow of the fluid that goes into my system. Things like chemotherapy, minerals and blood will need to be regulated closely as too much too quickly can send the body into shock. 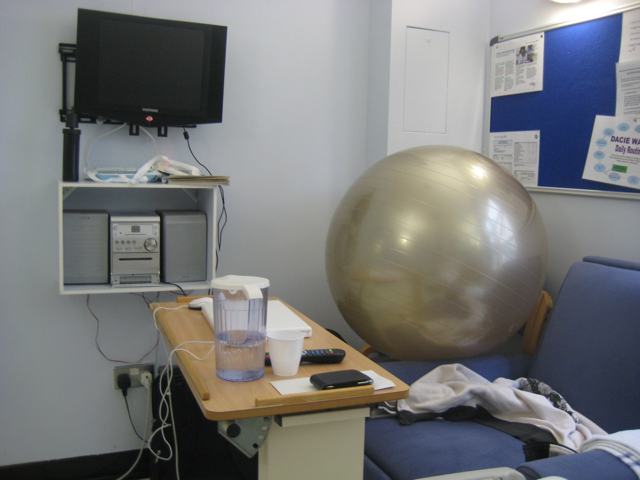 My exercise ball. Best thing I brought into the ward. I sometimes use it as a chair to sit on while I am on the computer. It forces me to sit with a proper posture, otherwise I will fall off it. And it’s great for simple workouts. Needs a fair bit of pumping every week or so otherwise it will be too flat to use. The only thing that’s bugging me at the moment, is how I’m going to get it into the car when I am discharged. It will have to be deflated before it can fit into the car, and I will need to spend 10 minutes or so of pumping to get it inflated again. The one thing about this room is that it’s right next to the nurses’ station. So it’s always busy, especially during the day. There are beeps from pagers, beeps from the call buttons, alarm buzzes, phones ringing, people talking, etc. Luckily it quietens down after 10pm or so, otherwise I won’t be able to get any sleep! The one thing that I noticed has changed over the course of the last 3 months is that I now prefer sweet things over savoury ones. 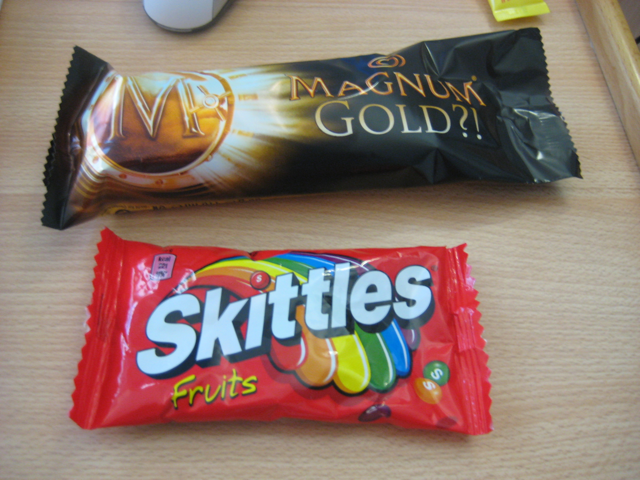 Which is why I went out to get some ice cream and skittles. 🙂 Awesome. Well, not quite first as I’ve had blood before, but it seems I need more now. Blood haemoglobins are a little on the low side, which probably explains why I am feeling more tired than usual. But I am feeling pretty good for someone with that level of haemoglobins, as most people will tend to be lying in bed and not moving much. The thing about getting blood is the wait. It doesn’t matter what time the blood is ordered, or how many units, for some reason, the blood will alway arrive late. As it takes 2 hours to administer a unit of blood into a patient (most people get at least 2 units), it can be a very long day of drips and being hooked to a machine. It’s also more work for the nurses, as they have to monitor the patient’s BP and temperature closely when they’re getting blood in case of a reaction. But I think the scariest thing about getting blood is the perception of needing blood. We’ve always thought that blood transfusions are for people who are in a dire need for blood, e.g. after an operation or a bad accident, where they’ve lost a lot of blood. That makes it really scary. It’s actually more common that you think, especially in this case. Patients here get blood on a regular basis. Some get it almost every other day. Not the most pleasant experience or thought, but one that’s necessary.